Each Sunday, we’ll recap the college football weekend with a focus on the top teams, big games, upsets and locally, the UB Bulls. For the second week in a row UB beat a quality opponent. Last week UB beat Temple on the road. Temple this week went into Maryland and dominated the 2-0 Terrapins 35-14. This week a good defensive team in Eastern Michigan came in fresh off a victory over Purdue in West Lafayette. The Bulls took control early scoring on their first two possessions. Then the game got bizarre. Three straight plays of over 70 yard touchdowns. I’ve never seen anything like it in any football game. The Bulls led 21-14 after that stretch. The Bulls couldn’t be stopped in the first half offensively and took a 28-14 lead on Kevin Marks’ second rushing touchdown of the day. Eastern Michigan got the benefit of a questionable clock at the end of the first half. The Eagles scored on the last play of the first half to pull within 7 at 28-21. The first half had 600 yards of offense. It was an entertaining game for sure. Tyree Jackson sealed the win with a 75-yard TD pass to KJ Osborn. Osborn had a career day with 7 receptions for 188 yards and three touchdowns. Tyree Jackson had his best game of the year. He missed on only five passes. He was 21 of 26 for 325 yards and three TD’s. The Bulls defense improved in the second half. The one real positive for the Bulls defense was they had six sacks in the game. Chuck Harris had 2 ½ sacks to lead the way. The Bulls improve to 3-0 for the first time since 1983. Next up is a Rutgers team that lost 55-14 in Kansas. The Badgers had a 41 game unbeaten streak against non-conference opponents snapped at home. These two teams have a similar smash mouth philosophy. Squally Canada ran for 118 yards and two touchdowns for the Cougars to lead the way. The pressure to avoid the upset got to normally reliable kicker Rafael Gaglianone. The Badgers kicker had a chance to send the game in OT but missed a 42-yard attempt with under a minute to play. Key to the game is Wisconsin has first year starters on the outside of their defense (DE,OLB and CB). The Cougars exploited this with jet sweeps all day. I feel LSU felt disrespected by being a 10-point underdog coming into this game. LSU started off hot and built a 10-0 lead. Auburn responded and built a 21-10 lead early in the third quarter. 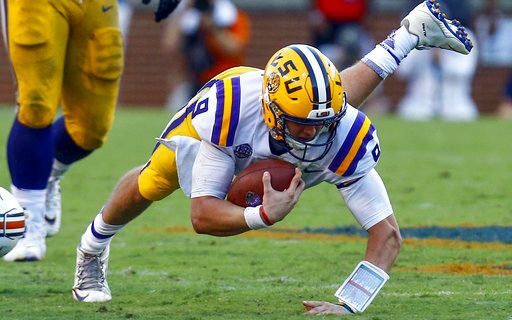 It looks like LSU might finally have a decent QB in Joe Burrow. Burrow hit Deshaun Davis for a 71-yard TD to pull LSU within 21-19. Jarret Stidham and the Auburn offense couldn’t put the game away and had to punt the ball away with just over five minutes to play. The Bayou Bengals drove to the Auburn 25 and set-up a Cole Tracy 42-yard game winning field goal as time expired. Bottom line is both these teams a legit. *Syracuse wasted Florida State in the Carrier Dome 30-7. The Orange are for real. This is the third straight disappointing performance by FSU. Why did FSU let Jimbo Fisher go? *Have to hand it to Miami-Florida for playing a home and home with Toledo. Most teams wouldn’t do that. The Canes Malik Rosier had five touchdowns in a 49-24 win at the Glass Bowl. *Alabama gave up a 75- yard TD on the first play of the game to Ole Miss. They then scored the next 62 points to win in a romp. The Tide had back-ups in by the second quarter. *Fun game of the day was in Purdue. The Boilermakers fall to Missouri 40-37, but two great QB performances. NFL prospect Drew Lock threw for 375 yards and 3 TD’s. Purdue’s David Blough threw for a program record 572 yards and three TD’s. *San Diego State is tough this year. They almost beat Stanford in Week one and now handed Herm Edwards his first loss with 28-21 victory over Arizona State. *The Scott Frost era has started poorly in Nebraska. The Cornhuskers fall to 0-2 after losing at home to Troy. *Is Texas finally back? Tom Herman finally gets a big win by knocking off (22) USC 37-14. I think this says more about USC then it does Texas. Neither teams is that great this year.